This is brilliant. 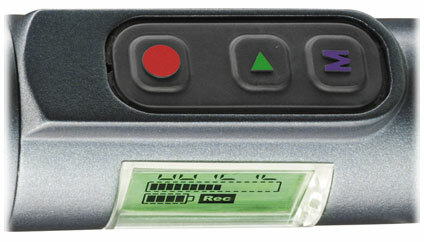 Forget about plugging that microphone into a fancy new digital recorder – make the microphone into a digital recorder. The worlds first professional digital recording microphone. 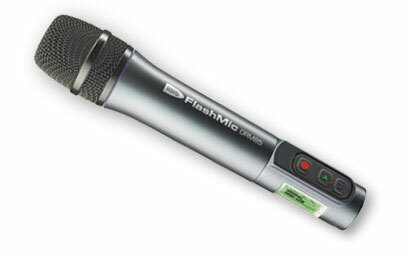 Combining a high-quality, Sennheiser omni-directional condenser capsule with an inbuilt, broadcast-quality Flash recorder, FlashMic is a convenient, easy to operate and durable recorder thats perfect for press and broadcast journalism, or any other voice recording application. With no messy cables, just one button press is all it takes to start recording in either linear or MPEG 2 formats. Simple drag and drop file transfer at up to 90x real time to a Mac or PC for editing or onward transmission is enabled by a plug and play USB connection. Two AA batteries provide more than 6 hours continuous power and, with a 0 – 10 seconds pre-record buffer and 1GB of flash memory, you can be sure that youll never miss a word of that important interview with a FlashMic. I’m not sure I’d like to spend a lot of time hand holding this 13 ounce baby, I’d prefer removable memory, and who knows what happens if you drop it – but this looks like a fabulous idea for certain situations. The real issue is the price. $ 1400.00 Canadian (that’s the discounted price at Oakwood Broadcast in Winnipeg) is a pretty steep price to pay for the convenience. For the same price, you can pick up a great digital recorder with a lot more features, a decent mic, even some pesky cables, and still have money in the bank.